Lyle: In this lesson we'll cover slide guitar licks in the style of Billy F. Gibbons from ZZ Top. If you don't have a slide, you can pick one up for under $8 at your local music store. There are glass, ceramic, brass, and steel slides and are available in many sizes. I like the steel ones because they don't break! You can use them on your ring finger or your pinky. Gibbons uses a glass slide. Picky: Do they make any difference in sound? Lyle: They make a little bit of difference in the sound, but when you're using distortion, it's very hard to tell. Lyle: Notice it's smack dab on top of the fret wire. Also, don't press down very hard on the strings, just glide the slide over them while dragging your index finger along the strings behind the slide. This will help mute unwanted noise. Lyle: Above is a video of me playing this slide riff. Notice I'm dragging my index finger along the strings behind the slide, then I move my index out of the way when I slide back down. Lyle: Use a clean or distorted tone. Picky: Does sliding damage your guitar or the frets? Lyle: It can if you are pushing too hard, let it glide over the frets so you're not bumping them. Lyle: Slide riff 3 uses the D chord at the 7th fret, then the C chord at the 5th fret again before it slides "off" to open. Lyle: Heavier strings are better for slide because they add tension so you can push a little harder without bumping the frets. Lyle: Slide riff 4 uses all 3 chords G - D - C. The G can be played at the 12th fret as well as the open position. Lyle: Here's a jam track for you to use. It's a 12 bar blues progression in G.
Lyle: Riff 1 is built off the G chord at the 12th fret. Lyle: Start on the D string this time for riff 2. Lyle: Blues riff 3 is a bit tougher, you'll jump up an octave from where you were playing the first two riffs. Lyle: When adding vibrato, gently move the hand back and forth like in the video clips, keep the slide hovering right over the fret. Lyle: For the last part of this lesson, I've made up a couple 12 bar solos for you to examine and learn. Many of the riffs you've learned so far are used in these solos, along with variations of them and more! Lyle: Solo 1 is easy, using just chords and following the progression. Lyle: Solo 3 is the toughest of them all. You can always listen to it and pick out the licks you like and want to learn. 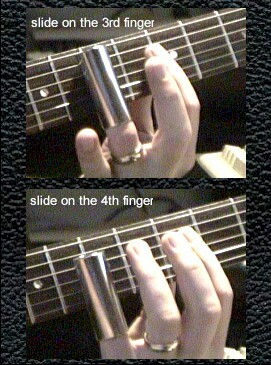 I hope this helps you learn the basics of playing in the style of ZZ Top using the slide. Lyle: At the beginning of the lesson there is a sample of me playing 3 solos, they are a little different than what I played here in these last 3 solo TABs. Lyle: welcome, thanks for coming to the lesson tonight. 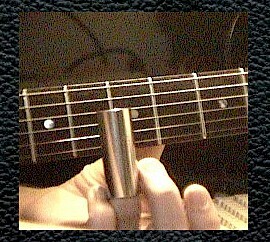 If you would like more study with the slide check out Slide Guitar for Beginners and Slide Guitar / Open tunings at the Riff store. they are on CD-ROM. jackflash: yep your cd's are great i have about 12 of them! Lyle: good night everyone, have a good week and see you next time!